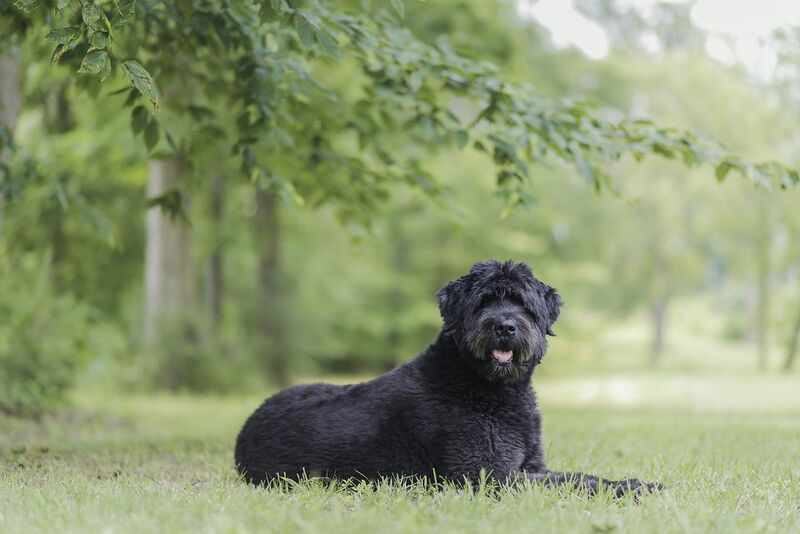 The bouvier des Flandres is a confident and powerful dog with a rough coat and a large, sturdy build. The breed's beard is one of its distinctive features. In fact, the breed's Dutch nickname, vuilbaard, means "dirty beard," The bouvier is a large, rugged herding dog that is intelligent and agile. Above all, this breed is a loyal companion that prefers to be with its people. The bouvier des Flandres originated in Belgium where it was developed as a multi-purpose farm dog during the late 19th century. They are believed to have been bred from Irish wolfhounds, Scottish deerhounds, and local farm dogs. They were used as drovers, draft animals, and protectors. The breed has been known best as an excellent cattle herder, which is the meaning of the French word bouvier. Nicknames for the breed included vuilbaard (dirty beard), koehond (cow dog) and toucheur de boeuf (cattle driver). By the early 20th century, the bouvier had grown in popularity. An official breed standard was established in 1912. However, World War I and the battlefields of Belgium nearly wiped the breed out. They were used for military purposes. Fortunately, some survived and enthusiasts kept the breed going. The bouvier arrived in the United States in the late 1920s and was recognized by the American Kennel Club (AKC) in 1929. In Belgium, the title of a champion still requires that the dog has won a working dog competition. The shaggy coat of the bouvier requires frequent and intensive grooming in order to keep the coat in good shape. Loose hairs are retained in the double coat and must be combed out. A lack of proper grooming can lead to serious matting. This may involve trips to a professional groomer. Some owners prefer to keep the coat trimmed short, but you will need a groomer who knows the right way to trim this dog or you will not get the appropriate look. Though the grooming demands of the bouvier are high, a benefit of the coat type is that it sheds very little. You'll find this dog's coat will naturally pick up debris from daily walks. Thus, you will need to spend some time after each exercise session cleaning your dog and your house from what he will track in. The bouvier is driven and intelligent. Like most herding dogs, it possesses a strong prey drive. Therefore, the breed requires a solid foundation of obedience training and strict discipline. This is a very large dog that can be difficult to handle without good training. The bouvier may appear to be calm and laid back, but the breed still requires daily exercise. A fenced-in yard is beneficial, but play sessions and walks are still very important. Establish a daily routine of walks and play in order to provide both physical exercise and mental stimulation to your bouvier. You might find his natural herding instinct kicking in to herd you when you walk together. The bouvier can make a wonderful pet for many kinds of households, but this breed is not for everyone. Use caution around cats and other smaller animals until you have a good idea of your bouvier's prey drive. Bouviers will do best with smaller animals when they have been raised together. This breed can get along well with children, but be aware that they may try to herd them, especially small children. In addition, young bouviers may not realize their size and knock over little kids. Consistent and structured training along with exercise is key. Raising this breed properly can result in a long, happy and fulfilling companionship. The Bouvier des Flandres is a loyal, friendly dog that craves human companionship. A bouvier needs interaction with his family, so he is not best left alone for long periods. Otherwise, he may develop behaviors like chewing and barking. Bouviers are reserved around visitors and strangers. If not properly socialized, this breed may become overly protective or shy. Bouviers should be fed two meals per day with a total of three to five cups of dry dog food, with the amount determined by your dog's specific needs and activity level. As a large breed, they are prone to bloating and stomach torsion, which can happen if they gulp down their food or eat too much at one time. This is a medical emergency. Bouvier des Flandres puppies need a low-calorie diet to ensure they don't grow too fast, which can make them more prone to bone disorders. Bouviers are known for odorous flatulence. Monitor your dog's weight to ensure he does not get overweight, which will predispose him to more health conditions. Your dog's needs will change throughout his lifespan. You should discuss this with your veterinarian to get recommendations for feeding schedules, amount of food, type of food, and exercise. As with any breed, if you think the bouvier des Flandres is right for you, be sure to do plenty of research before obtaining one. Talk to other bouvier des Flandres owners, reputable breeders, and rescue groups to learn more. There are a wide variety of dog breeds to choose from. With a little research, you can find the right one to bring home.